Parts coming in contact with the vial / aluminum cap /exposed to the atmosphere are made out of stainless steel. 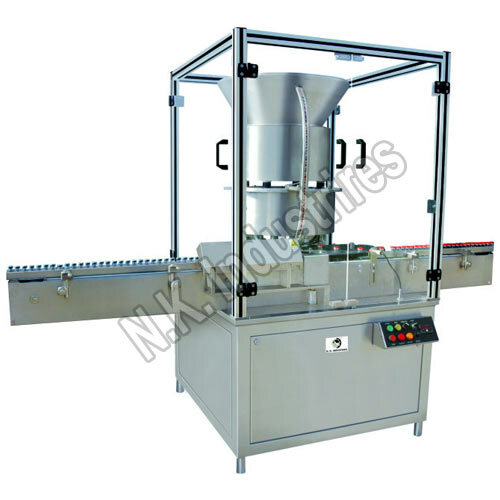 NKCS-450 Automatic Twelve Head vial Cap Sealing Machine is a high speed machine used for sealing of Aluminum Caps on vials. Aluminum caps kept in vibratory bowl automatically orient caps in right direction before entering the delivery chute. Vial during its rotation movement within feed star wheel, it picks up aluminum seal from the retaining finger of delivery chute and correctly position on the vial before entering sealing turret. Now sealed vials are transferred to exit star wheel pocket and further moves out on to the flat conveyor belt.